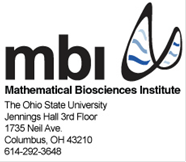 Two-week Introduction (June 2-13, 2014): Tutorials, computer labs, and team efforts designed to introduce students to a variety of topics in mathematical biology. Eight-week REU Program (June 16-August 8, 2014): An individualized research experience as part of a research team at a participating institution. There are 14 projects to choose from. Capstone Conference (August 11-15, 2014): A student centered conference featuring talks and posters by student researchers in math biology, keynotes by prominent math biologists, and a graduate studies recruitment fair. For full consideration, completed applications must be received by Monday, January 27, 2014. Applications for the TWO-WEEK INTRODUCTION ONLY will be due in April. Applications for the CAPSTONE CONFERENCE ONLY will be due in June.